''According to economists who have analyzed Labor Department data, 6.6 million people exited the workforce from 2010 and 2013. About 61 percent of these dropouts were retirees, more than double the previous three years' share. People dropping out because of disability accounted for 28 percent, also up significantly from 2007-2010. Of those remaining, 7 percent were heading to school, while the other 4 percent left for other reasons. Thats a pretty big shift. The more recent 3 years we can see that most of the people leaving are leaving for retirement. Thats a demographic change we'd expect due to the baby boomers retiring. Theres also a fair amount of people going into disability, and I assume many of them are baby boomers too. Thats also a pretty expected trend. Compared to the 07-10 period when most people left to go to school or 'other'. Annoyingly the article doesn't break down the % of people who went to school versus other reasons and lumps them together. But clearly that large of a drop in the labor pool for school or other is not explained by demographics and is not expected. I recently talked about a survey of Americans asking who felt they were in the middle class vs lower or upper classes. There has been a large increase in the percent of us who think that we're in the lower class. I wondered if incomes have plummeted for a large portion of Americans or if this was more of a perception thing. I found detail on household incomes for each fifth at the Census. That doesn't look so good. 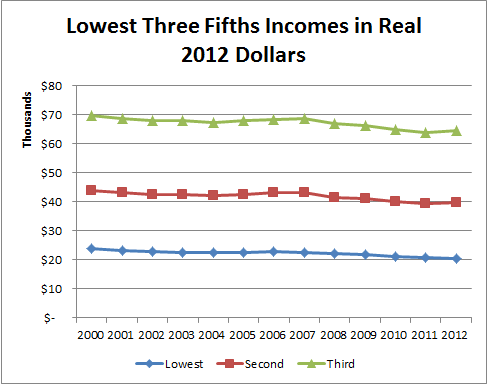 Incomes are down from 2000 in real dollars in every fifth as well as the top 5%. 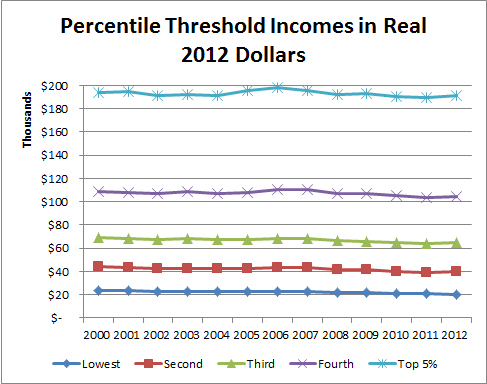 There you can see more clearly the drop of real incomes for the bottom 60% of people. I started with the idea of writing an article asking why everyone in America seems to think they're in the middle class. Too frequently I see people with very high or very low incomes self identify themselves as members of the middle class. I just saw someone with an income over $200k talk about being in the middle class for example. Then I found this survey Despite recovery, fewer Americans identify as middle class from the Pew Research Center. Their survey found that 44% of people call themselves middle class, which is not what I'd thought. I had the apparently mistaken impression that the vast majority of Americans called themselves middle class. They also show that 15% of people are in the upper or upper-middle class. That number is higher than I'd thought too. However they don't seem to break it down to who thinks they're in the upper class strictly versus people who claim upper-middle class status. I'd be interested to see that breakdown. Sadly a whopping 40% of Americans feel they are in the lower class. Whats worse is that in just the past 6 years the size of the middle class has dropped from 52% to 44%. The upper class dropped from 21% to 15%. The lower class has shot up from 25% to 40%. If that trend continues then in a couple years the lower class will be larger than our middle class. Last year I earned over $800 in rewards and bonuses with my credit cards. I'm hoping to increase that this year. Theres some good rewards cards out there that would help me add several hundred to that amount. Below are 3 key cards I'm working on getting and the kinds of rewards I could get. I estimated the rewards based on what I can get above the current cards I've got. This one currently has a promotion for a $75 sign up bonus*. The card rebates 2% of ALL purchases into a linked Fidelity account. We could use this to replace our primary spending card and raise our rewards on most purchases from 1% to 2%. I figure that would net us a good $450 a year on last years spending rate. We easily spend $250 on groceries / gas a month so that 5% rate would net us $90 a year. Also from what I've heard the $750 on book purchases actually counts Amazon.com as a bookstore and we shop there quite a bit. Last year I count a whopping $7400 in purchases on Amazon. This 5% above the 2% could give us another $225 a year in rewards. This one has different categories you can pick to get 2% and 5% rates. Earn 5% cash back on your first $2,000 in net purchases each quarter on the combined two categories you choose. You can see the categories here Potential options for the 5% categories for us would be : cell phone bill, restaurants & charities. However we don't spend a ton in those categories. You can also get a $25 Cash+ Bonus when you redeem $100 or more in a single redemption once a year. * I got that link from MyMoneyBlog and its likely a commission link for MMB. Just FYI, you might be helping MMB earn a few bucks if you sign up via that link. PlanetMoney answers Who Had Richer Parents, Doctors Or Artists? by sharing data on the average household income during childhood for various professions. We got over $800 in rewards from our credit cards last year. That seems like a lot but it isn't really all that hard to do. I figured it would be a good exercise to estimate how much an average American household might earn by smart use of rewards credit cards. I went to the BLS CEX and found average spending per household. From that I split things into categories that would be stuff you can use a credit card for. I am assuming that your mortgage or rent, your household utilities, car purchases, health insurance and some other items are not things you can pay with credit card. Now in those categories there are certain ones that can qualify for 5% rebate deals. groceries, gasoline, restaurants, charity and telephone. Those spending categories can get 5% for either some or all of the year with certain cards. If you don't want to bother to get 4 cards and use different cards for different categories then you could just get the 2% Fidelity card and use that one card for everything. Just using the Fidelity card would net the average household $477.62 a year in rewards. I think its worth that rewards money just to pull out another card for specific purchases. You could probably even get more rewards than what I've listed here. For example the Blue card has 3% in gas stations and if you use the Blue card for gas 6 months of the year thats another $13.26 a year. You might be able to pay some of your household utilities via credit card as well and get 2% there. RetireBy40 has a different take on the question Save for Retirement First or Children’s Education? While I don't put college savings above retirement myself, given his circumstances I don't think his choice is too bad. and I think its good to keep things in perspective and compare recent deficits to WWII (not to say I think almost continuous deficit spending is great). Slate has a calculator to help you decide if Amazon Primes new $99 cost is worth it or not. But I'd point out the calculator is fairly crude and just figures cost of shipment per item and doesn't consider free shipping that Amazon has outside of Prime. If you're a landlord for very long then I think it might be impossible to avoid being an evil landlord. At least in the eyes of some tenants. I previously wrote my theory on Why Some People Think Landlords Are ALL Evil Slumlords. In summary my thought was that most people run into a bad landlord so they walk away with a bad general impression. Yet few people are landlord and don't see the other side of the story. But then there are also difficult and almost inevitable situations that landlords get into with tenants where we are faced with hard choices. I thought I'd give a couple specific examples showing both sides of the landlord and tenant situation to illustrate how people lack the landlord perspective and only hear about the evil landlord story. Both of these examples are real situations that I've ran into as a landlord. Tenant story: When I got out of the hospital my evil landlord had kicked me out! Someone comes home from the hospital and finds they've been evicted from their home by their landlord. Must be an evil landlord right? I mean what kind of heartless person would evict a sick person? We've had this kind of thing happen to us. One of our tenants fell very ill and was in the hospital for a long period. I want to say he was there a month or two but this was a while ago and I can't really remember the specifics. In the meantime he was already behind on rent and paid no rent while he was in the hospital. During his illness he lost his job. He also had pretty bad outlook and it wasn't clear if he'd be able to work in the future or how long he'd be in the hospital or if he'd even be able to care for himself. In the meantime we had a vacant rental for 1-2 months and unpaid rent. Eventually we declared the apartment abandoned (legally) and remove his possessions. Oh, did I mention that rental was totally trashed? Landlord perspective : We had a tenant 3 months behind on their rent who was unemployed and in the hospital. We had no choice but to declare the unit abandoned, house their property at our expense for a month then take a loss on the rent and most of the cost of cleaning out the apartment. What would you do? How long do you let someone live in your your rental for free if they are sick? Would it matter the reason they are sick? Should you give free rent to someone because they had a better reason for being hospitalized? Or should you kick them out faster if they have a really bad reason? How much free rent out of your pocket should someone get in general due to hospitalization? And we are talking about free rent here. If I had good reason to expect I'd get paid then we certainly would not have made the choice to remove them. That raises another question... how do you know if you'll ever get paid? Is someone calling you and ensuring you that the rent will be paid? Probably not. Tenant Story: The evil landlord left us without heat over Christmas. We had a tenants heater break down over Christmas one time. As soon as we found out it was broken we called a repair service to go out and work on it. Of course its sometimes hard to get a furnace repair guy out to you over Christmas. In the meantime our tenants lacked heat ... during Christmas. It was a pretty awful timing. This was for a property in another state so we did not have the ability to fix it ourselves, not to mention that I don't know anything really about fixing furnaces. The tenants ended up staying with family, but if they hadn't then I think its fair that we'd have been on the hook to pay for a hotel. If I recall right we knocked some money off their next months rent to say 'sorry', but I'm not sure on that detail since this was a while ago. Landlords perspective: We did everything we could but the repair guys couldn't make it till after Christmas. It was just awful luck that the furnace broke down over Christmas. How would you handle that differently? Unfortunately this one was really just bad timing and we felt we had done everything we could. If you bought a computer, printer, memory module, graphic card, video game console, DVD player, PDA, MP3 player, Tivo/DVR, server or other DRAM product any time between January 1, 1998 and December 31, 2002? If so then you're entitled to part of a lawsuit settlement by DRAM makers. DRAMclaims.com is the website setup for the class action settlement. The settlement is for $310 million total and the minimum recovery is $10. No documentation is required to file, so you don't have go to dig up your 15 year old receipts. You can often find median or average wages for the different education attainment levels. But I wondered how the distribution of wages looked for each. I mean are they all pretty symmetrical distributions at each education level? Or might it be flatter at the lower education level and wider distribution at the higher education levels? Overall I would say that the income distributions don't vary a whole lot based on education level. The top 10% makes roughly double the median and the bottom makes 50-60% of the median. The bottom 10% wage level is supported by the minimum wage so that may explain why its a little higher % of median than other education levels. Are high income people 'rich'? Not necessarily. Sometimes however we see income used interchangeably with wealth. For example a news story might talk about 'rich' or 'wealthy' people but only cite income statistics but not net worth. This is a point that Free Money Finance has complained about in the past. Income is not the same as wealth. You can for example have someone who makes 6 figure income but has negative net worth, like maybe a new doctor with high student loan debts. And you can also have people with relatively low incomes but very high net worths, like a retiree with a very large nest egg built over a lifetime. However there is a pretty high correlation between income and wealth. Most low income people aren't rich and most high income people are not poor. There are always exceptions but if you look at the statistics the trends are quite clear. I decided to see what kind of information I could find to show the tie between income and wealth. Can we look at a high income and assume that person is wealthy? How likely is a high income household to also have a high net worth? The Survey of Consumer Finances (SCF) has info on income and assets in one place. You can also find discussion of the topic in the Federal Reserve paper Changes in U.S. Family Finances from 2007 to 2010: Evidence from the Survey of Consumer Finances Table 4 on page 17 has the net worth data per income group. 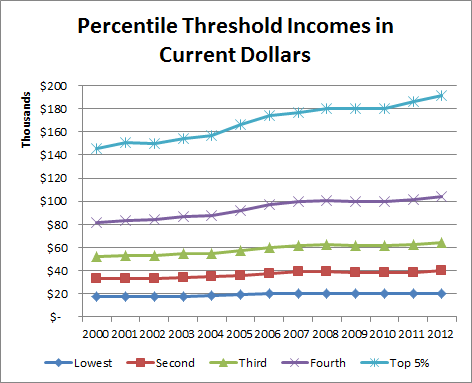 Focusing on the top 10 % income group we can see that their median income is $205k and their median net worth is $1,194k. Half of the people in the top 10% make under $205k and half of them make over $205k. There is no upper limit on that group so the top .001% makes a very large annual income. We also know that half of the people in the top 10% have net worths making them millionaires and then some. This does not however mean that people who make over $205k are all millionaires. There are some millionaires in the 90-95% group making under $205k and some non-millionaires in the 95-100% group making over 205k. In fact the net worth of the people in the top 10% income bracket could range from severely negative to billions. And any income percentile group will have a range from bankrupt to millionaires and then some. I doubt there are any billionaires in the bottom income bracket but theres certainly many millionaires. Looking at the median net worths tells us that 50% of the people in each group has more or less than that amount. So for the bottom 20% of income earners 50% of them have net worths of less than $6000 and 50% of them have net worths over $6000. Then at the top 10% of income earners half are below $1.194M and half are above $1.194M. While income doesn't really tell us what someones net worth is, we can say that most people with incomes over $200k are millionaires. Now if we drop down to the top 20% we have a median income of $113k and the 80-89.9% group has a median net worth of $287. That group seems much less likely to be millionaires. I'm certain there are a good number of millionaires in that income group but we don't know what portion of those people are millionaires. I don't have more information on how net worth varies within given income groups. I tried to find that but couldn't come up with anything. It would be nice to have a better distribution of net worth values for each income level. But we'll have to make due with just the median figures. So that shows us a little of how net worths are distributed but not related to incomes at all. You can see that the frequency of strikes was huge back in the 50's and 60's compared to nowadays. And these are only the large strikes of 1000 or more people that lasted at least a full work shift or longer. 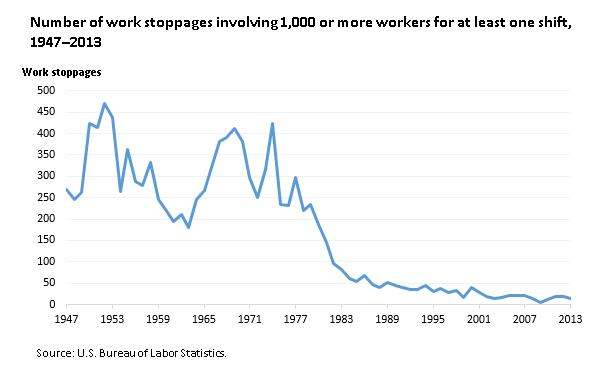 The # of stoppages peaked at 470 in 1952 and hit a low of just 5 in 2009. In 2013 there were 13 strikes. Every day or so there was a large strike back in the 50's but now its only about once a month. Yahoo's finance blog The Exchange wrote that Two dozen countries with a higher minimum wage than America’s That sounds pretty bad that we come in behind 2 dozen countries. Even worse the article compares the US to 27 OECD nations and we're 26th. I underlined that last bit for emphasis. The USA has relatively high average wages. Some of you may scoff at that idea because we Americans seem to be all convinced that we're struggling to make ends meet and that our wages can't possibly be 'high'. But rest assured we (the richest nation in the world) do in fact have high wages compared to most other nations. Greece's minimum is $5.19 per hour which is much lower than the US minimum of $7.25. Greece's average wage is about $1100 a month and the US average is cited as $3693. Their minimum wage then is about 78% of the average wage and the US minimum wage is about 33% of our average. SO by this measure of minimum wage / national average then Greece's minimum wage beats the US minimum wage. Would you rather make $5.19 an hour or $7.25 an hour? I'd prefer $7.25 an hour. And I don't really think I'd care what % of the national average that figure represents. How about you? Would you like to be broke in a broke country or less broke in a well off country? Now this isn't to say that the US has a particularly generous minimum wage. We fall behind many industrial nations for sure. And I can see some of the argument for putting minimum wage in relation to national average since countries with high average wages often have higher cost of living. But its still just not all that effective of a measure as far as I'm concerned. Business Insider compared wages in Here's How America's Minimum Wage Stacks Up Against Countries Like India, Russia, Greece, And France and their graphic shows us coming in behind Australia, Australia, France, New Zealand, UK, Canada and Japan. If you sort the List of minimum wages by nation then we come in at 13th in that list among all countries. If you sort the List of average wages by nation then we come in 16th.